When a crime occurs, investigators are on the case. Using a careful scientific process, they study the clues, including fingerprint, ballistics, digital, and blood evidence. Follow along and see how these highly trained crime scene and forensics investigators analyze what's left behind to move cases forward. A shooting has occurred. Investigators have not yet found evidence. Then they look in a storm drain and find shell casings. They put the casings in a paper bag and send them to the lab to be analyzed. 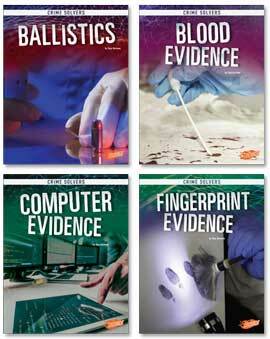 Find out about the techniques and tools ballistics experts use to help bring even the toughest cases to a close. A crime has occurred. Investigators have not yet found evidence. But when digital analysts arrive, they take a computer from the scene and find their first clue. Find out about the techniques and tools digital forensic investigators use to help bring even the toughest cases to a close. A robbery has occurred. At first glance, it looks like nothing was left behind. But when fingerprint analysts arrive, they use a special light to find latent fingerprints. Find out about the techniques and tools fingerprint analysts use to help bring even the toughest cases to a close.